People have been calling Google+ dead for nearly as long as it’s been around, but it just keeps on going in form or another. This week, Google announced a big revamp that puts the spotlight on two features in particular. But what do the changes mean for businesses? How do you expect your Google+ usage to change based on the redesign? Share your thoughts in the comments. There was a time when it looked like Google+ would be the home for businesses on Google. Local search results were tied to Google+ pages, but Google has been separating Google+ from its other services more and more in recent years. Now, it’s unclear if there is really much business use to Google+ at all. The Communities feature launched nearly three years ago as a place to “crowd around common interests and meet new people,” as Google put it at the time. Collections launched just a few months ago. It’s basically the Google+ version of Pinterest in the sense that you can just collect content around any given topic. A Collection on Google+ is like a board on Pinterest. You’ll see this clearly in our new navigation centered around Collections and Communities. Collections let you immerse yourself in content about topics like surfing (goo.gl/vvv5QD) or tiny tilt-shift photography scenes (goo.gl/nWyicL) . Communities enable groups of people with the same interests to join up and geek out on anything from Game of Thrones (goo.gl/aaqtgq) to Painting (goo.gl/kmlM7m). With Collections and Communities, discovering amazing things is simple: just follow or join whatever happens to pique your interests. But we didn’t stop with Collections and Communities; the new Google+ also makes it easier to post, search, connect, and keep up with great content in a fully redesigned home stream. And we’ve worked hard to make our new web experience load fast and work beautifully on devices of all sizes. It doesn’t focus on businesses, their description, reviews, videos or business photos. In fact the complete absence of those features in this initial roll out seems to indicate the final and rather draconian separation from any business related function. Over the past two years I have discussed the parting of the ways between local and Plus but through all of that Google had retained the essence of tabbed business pages and given the owner the ability to add a description, photos, videos and provided a place to send customers to see and leave their reviews. It’s possible that Google+ can still serve other businesses purposes including content marketing and networking, but in general, it seems to be of less use than ever before unless you’re there for very specific niche-related communications. There will surely be value in that to some. That all depends on just how much value a business can get out of collections in the first place. Google says it’s been a popular feature, but it hasn’t exactly been making the headlines much since its launch. Time will tell if businesses will get any real value out of the new Google+. My guess is that most will continue to shrug it off. For what it’s worth, a recent study from Stone Temple Consulting found that Google+ was still very good at being a place for longer-form discussions among people with common interests, and this is clearly the direction it’s focusing on now. For more on how people get engagement on Google+ (based on those findings), read this. 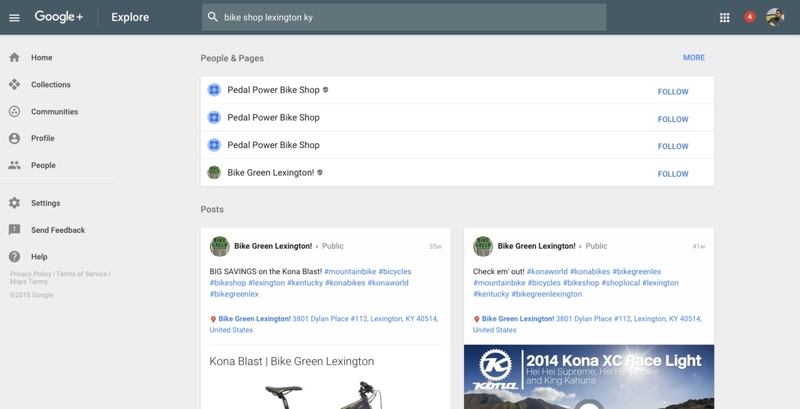 Does the new Google+ have a place in your online strategy? Let us know in the comments.